Monday, the day after our big event is always a huge cleanup. Despite everyone being tired from preparing for, and running the event we still had a heap of cleaning to do. And I had to get the generator back to the hire place and then the truck back to hertz. So I managed to get everyone to start getting as much garbage onto the truck as possible as fast as they could, because the clock was ticking and I was running out of time. So there was actually some garbage. But also there were lots of things to throw out. Like old medals, old collateral, cardboard boxes etc etc. Anyway the floor of the truck was full by the time I left. Off to the tip! Yuck! The tip is never a pleasant place to be. It’s smelly and dirty and you have to watch your step. Maybe I should have thought about what I was wearing a bit more carefully. I really didn’t want to wreck my nice white guess t-shirt, the one that screams girl because it hugs my curves. And I really didn’t want to wreck my favourite orange-red short shorts either. So I was trying to be careful. And then it happened. I was taking so long to unload the truck the tip guy came over to have a look. And then he looked at me and decided to offer his help to unload the truck. In all my years of coming to the tip this was a first. They certainly never ever offered to help before. But I guess this was Loretta’s first time at the tip. Well I wasn’t going to say “no thank you” now was I? So thank you Mr tip man for your help! 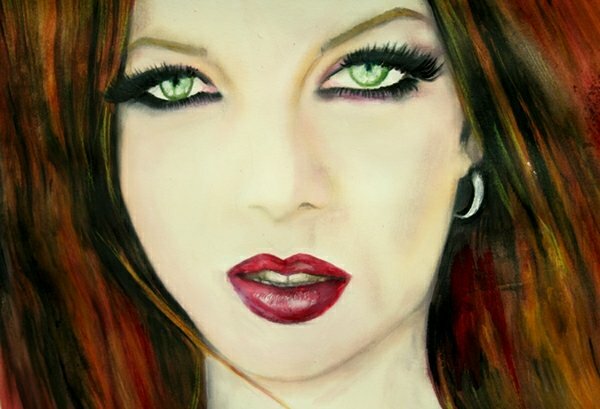 Painting of Shirley Manson from Garbage. Of course painted with Cherry Lips. Next ›So if I’m a girl…….